The Global Volcanism Program has no activity reports for Volcán Azul. The Global Volcanism Program has no Weekly Reports available for Volcán Azul. The Global Volcanism Program has no Bulletin Reports available for Volcán Azul. Volcán Azul (Volcán Blue) consists of three youthful trachybasaltic cinder cones on the jungle-covered Atlantic coastal plain of Nicaragua that were first noted by geologists during an aerial overflight in the 1960s. The three cones, located south of the Río Curinhuás and west of Pearl Lagoon, each have well-defined, steep-walled craters about 50-60 m across. In contrast to the circular rims of the other two cones, the rim of the easternmost cone is breached to the west. The well-defined craters and unusually low vegetation in an area of heavy rainfall and rapid weathering led Williams and McBirney (1965) to estimate that the cones were probably no more than a few thousand years old. Other trachybasaltic to trachytic Quaternary cones along the central Nicaraguan Atlanatic coastal plain are found at Pearl Lagoon and Kukra Hill. Janousek V, Erban V, Holub F V, Magna V T, Bellon H, Mlcoch B, Wiechert U, Rapprich V, 2010. Geochemistry and genesis of behind-arc basaltic lavas from eastern Nicaragua. J. Volcanol. Geotherm. Res., 192: 232-256. McBirney A R, Williams H, 1965. Volcanic history of Nicaragua. Univ Calif Pub Geol Sci, 55: 1-65. The Global Volcanism Program is not aware of any Holocene eruptions from Volcán Azul. If this volcano has had large eruptions (VEI >= 4) prior to 10,000 years ago, information might be found on the Volcán Azul page in the LaMEVE (Large Magnitude Explosive Volcanic Eruptions) database, a part of the Volcano Global Risk Identification and Analysis Project (VOGRIPA). There is no Deformation History data available for Volcán Azul. There is no Emissions History data available for Volcán Azul. Volcán Azul (Volcán Blue) consists of three youthful cinder cones on the jungle-covered Atlantic coastal plain of Nicaragua. 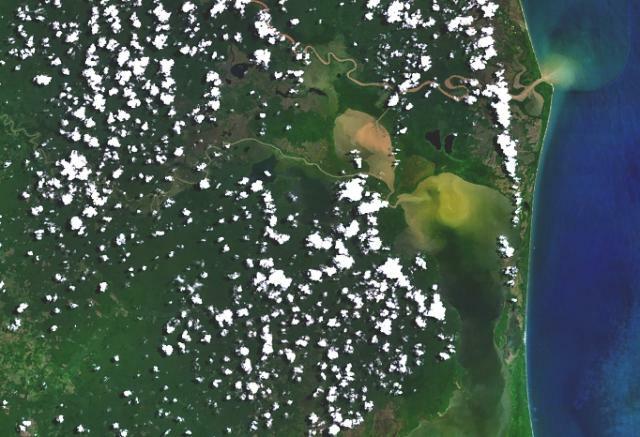 The cones are located at the lower left, west of Pearl Lagoon (right-center) and south of both the Río Grande de Matagalpa (which flows from the upper left to form the small point north of Pearl Lagoon) and the Río Curinhuás (left-center), which flows into the northern end of the lagoon. The three cones, each of which have well-defined, steep-walled craters, were first noted by geologists during an aerial overflight in the 1960s. There are no samples for Volcán Azul in the Smithsonian's NMNH Department of Mineral Sciences Rock and Ore collection. Large Eruptions of Volcán Azul Information about large Quaternary eruptions (VEI >= 4) is cataloged in the Large Magnitude Explosive Volcanic Eruptions (LaMEVE) database of the Volcano Global Risk Identification and Analysis Project (VOGRIPA).